Since its market introduction in January 2013, several hundreds of DU11 data units have been shipped to customers in the plastics and textile industry. 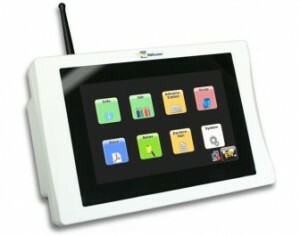 The DU11 is the high-end member of the BMSvision data collection terminals featuring a 7” touch screen and a graphical intuitive web-based user interface. It is the data collection device for companies striving for paperless manufacturing. It can be used as data collection terminal and HMI in combination with all BMSvision’s Master systems.The DU11 comes with wired Ethernet as well as BMSvision Bluetooth based wireless network interface. On screen language selection allows to switch between several western and Asian languages on the spot. By selecting a menu button on the touch screen, the operator can enter stop declarations, quality information, request information about current and planned orders, view the most important KPI’s or enter notes or comments as additional information to occurred events.With the document control function, set up and quality control documents, maintenance and packing instructions related to the job can be displayed thus eliminating the distribution of physical documents on the shop floor. BMSvision, established in 2007 as a carve-out from the Barco group, is a supplier of Manufacturing Execution Systems (MES) for discrete manufacturing, with focus on the textiles, plastics and pharmaceutical industry. Under the brand name BMSvision (formely BarcoVision) and with over 30 years of experience as a former division of the Barco group, BMSvision offers a wide range of systems aimed at productivity, quality improvement and energy management.